Home » Vietnam Visa on arrival posts » How to make payment? 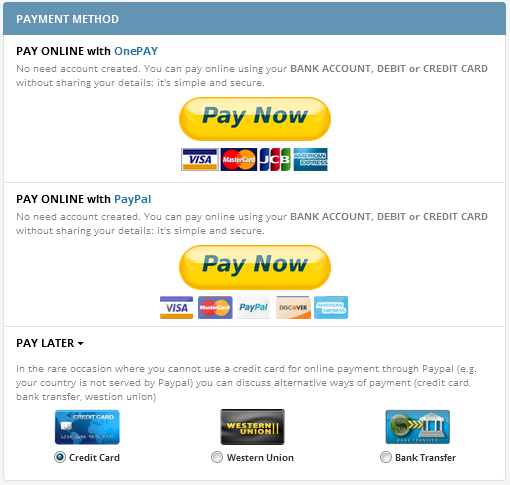 – By Paypal: If you are already a PayPal member, just login to complete the payment. OR you can also pay by Visa, Master, Discovery and Amex via PayPal. – By cards (Visa, Maste, JCB Or Amex) via payment gateway called OnePay. Simply provide your cards & Address information to complete. In some case, you need to provide token ID to complete the payment. – By bank transfer: We will send you bank details to pay via email. When done with paying, you will be required to send us an email to confirm. The international bank transfer takes 3 – 5 days for the payment appear in our bank account, so please send us bank receipt or any paper to prove that you paid to our bank account to proceed with your visa at earliest time. – By Western Union: We will send you details to pay via email. When do paying, you will be required to send us an email to confirm MTCN (money transfer control number) provide by Western Union. – By Xoom.com: In case you are a Xoom member and prefer to pay via Xoom, please send us XOOM tracking number.